String Studio VS-3 puts forth a truly distinctive sonic signature thanks to a collection of peerless string oscillators. We have streamlined String Studio and brought it to a whole new level. String Studio VS-3 combines two independent timbres—either stacked or split—to create performance-friendly, texture-full, and spacious sounds that are sure to make a good impression. 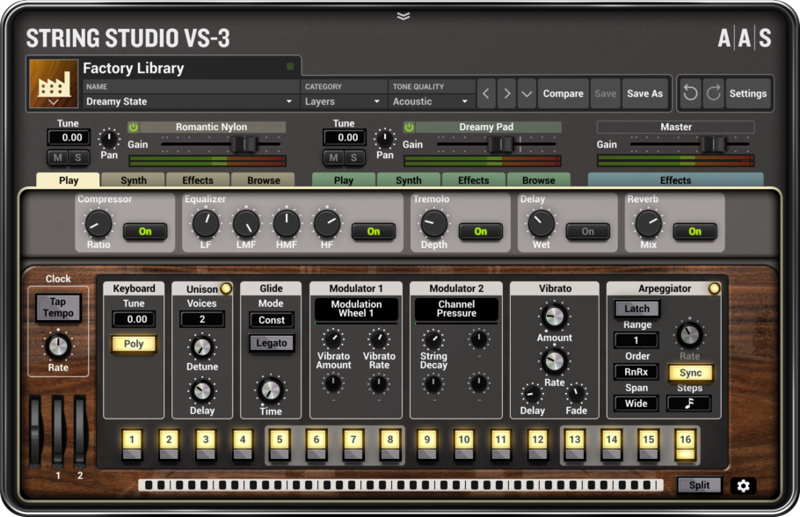 String Studio VS-3 now boasts two performance modulators per layer that respond to user-defined MIDI controls. Each and every sound features effect and morphing assignments that can be played in real time for enhanced expressivity and sonic dimension. A long and fastidious process of fine-tuning went down in the AAS quarters. Each and every sounds went under the eyes of all team members to exit with a consistent gain-stage, unity-gain effects, better dynamics, and compelling real-time sound transformation assignments. This is our most perfected sound library to date. 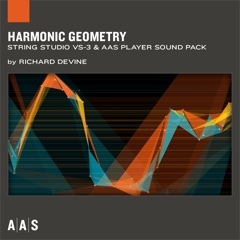 String Studio VS-3 ships with four brand-new signature sound packs created by top sound designers. Richard Devine, Christian Laffitte, Thiago Pinheiro, and Daniel Stawczyk form an incredible team that made the most of the latest String Studio VS-3 features. It’s with great pride that we present these 227 new sounds. 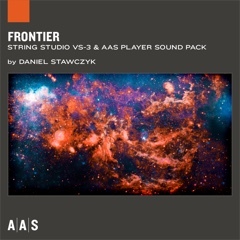 String Studio VS-3’s improved sound browser presents a simple way to find the sound you’re after. 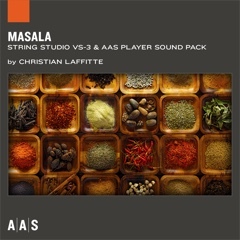 String Studio VS-3 sorts sounds by category to present an overview of a pack’s content. Additionally, shortcuts to categories and tone qualities provide a quick way to jump right where you need to be. String Studio VS-3’s filters can now put up with extreme modulation while remanding totally musical. 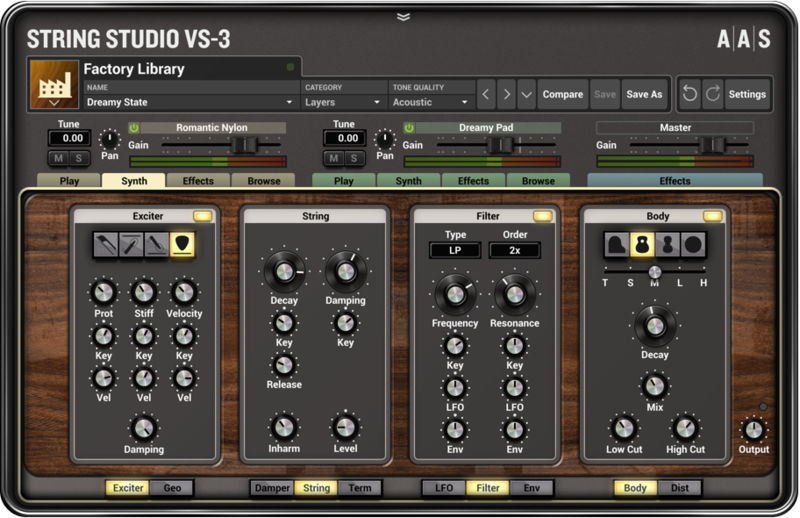 String Studio VS-3’s multi-effects module now sports reverb, equalizer, compressor, and guitar amplifier processors for even more completeness. Simply copy String Studio VS-2 banks in String Studio VS-3’s packs folder to convert them. 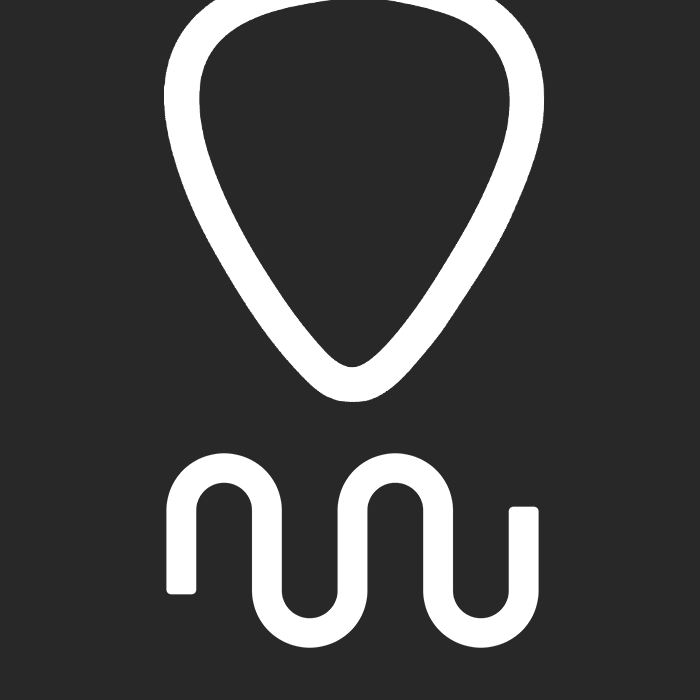 String Studio VS-3 now supports the Scala scale file format as well as reference note frequency tuning for microtonal music making. Fully functional. Less than 93 MB to download. Seconds to install. Consisting of strings, picks, bows, hammers, fingers, frets, and dampers, these oscillators offer a unique blend of modern and creative synthesis. 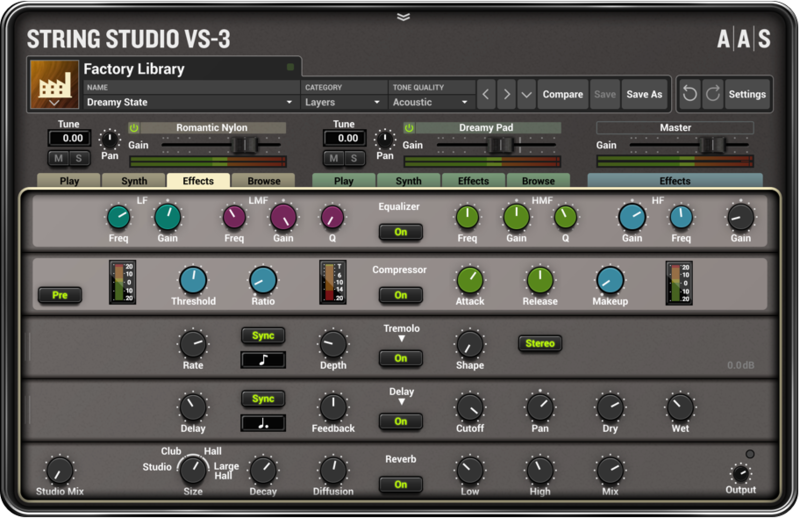 Augmented with classic filters, enveloppe, LFO, soundboard, and studio-quality effects, String Studio VS-3 offers a terrific balance between innovation and familiarity. 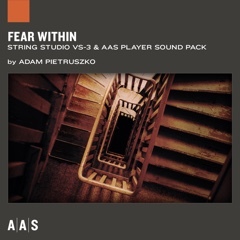 String Studio VS-3 holds an abondance of effects in three independent racks. Reverb, delay, distortion, phaser, chorus, flanger, filters, equalizer, compressor, guitar amplifier, tremolo—all assist in putting the final touch on a sound. String Studio VS-3 now boasts two performance modulators per layer that respond to user-defined MIDI controls. Each and every library sound features effect and morphing assignments that can be played in real time for enhanced expressivity and sonic dimension. With 800+ professionally crafted presets covering all the synthesizer sound categories, String Studio VS-3 packs everything you need to create all the parts of your productions. 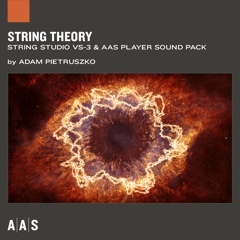 The 800+ sounds of String Studio VS-3 form a coherent whole with consistent gain-staging, unity-gain effects, better dynamics, and compelling per sound MIDI controlled variations. This is our most perfected sound library to date. String Studio VS-3 ships with four pristine signature sound packs created by unrivalled sound dwellers. 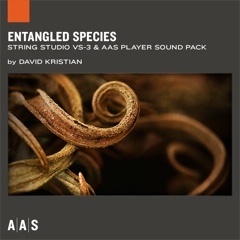 Richard Devine, Christian Laffitte, Thiago Pinheiro, and Daniel Stawczyk set forth a collection of unheard sounds that makes the most of the latest String Studio VS-3 features. Only a team can assemble a fine factory library—let’s introduce the 22 contributors: Ben Crosland, Benoit Charland, Carsten Schmid, Christian Halten, Christian Laffitte, Daniel Stawczyk, Deadbeat, Eric Thibeault, Erik Putrycz, Gautam, Glen Darcey, Harm Visser, JDG, Jean-Christophe Utz, Martin Walker, Paul Haslinger, Philippe Derogis, Richard Devine, Sean Divine, Simeon Amburgey, Thiago Pinheiro, and Vincent Gagnon. 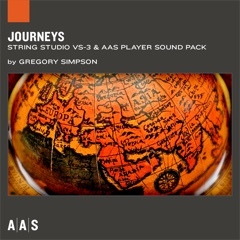 String Studio VS-3 shows high proficiency by covering 22 sound categories—basses, percussions, effects, impacts, noises, sweeps, keys, clavs, organs, bells, mallets, guitars, plucks, strings, leads, pads, arpeggios, layers, rhythmics, sequences, splits, and textures. With nine Sound Bank Series titles adding up to more than 1000 presets, String Studio VS‑3 looks forward to spark your imagination—whenever you need it. 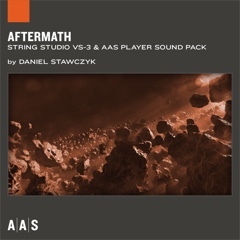 String Studio VS-3 is compatible with nearly all DAWs. *The minimum system requirements mentioned above are for standalone usage. For plug-in usage, please refer to your DAW software requirements (Sonar, Pro Tools, Cubase, Live, Digital Performer, Logic Pro, etc.). Select from among these options. What type of copy protection does String Studio VS-3 use? 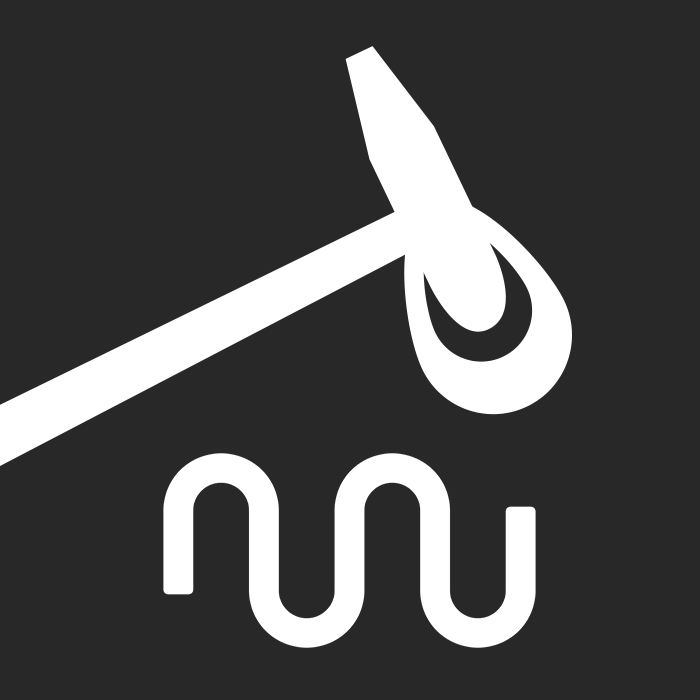 All AAS instruments use a proprietary copy protection based on a challenge/response mechanism. Can I re-authorize String Studio VS-3 if I upgrade or change my computer, or have a computer crash? 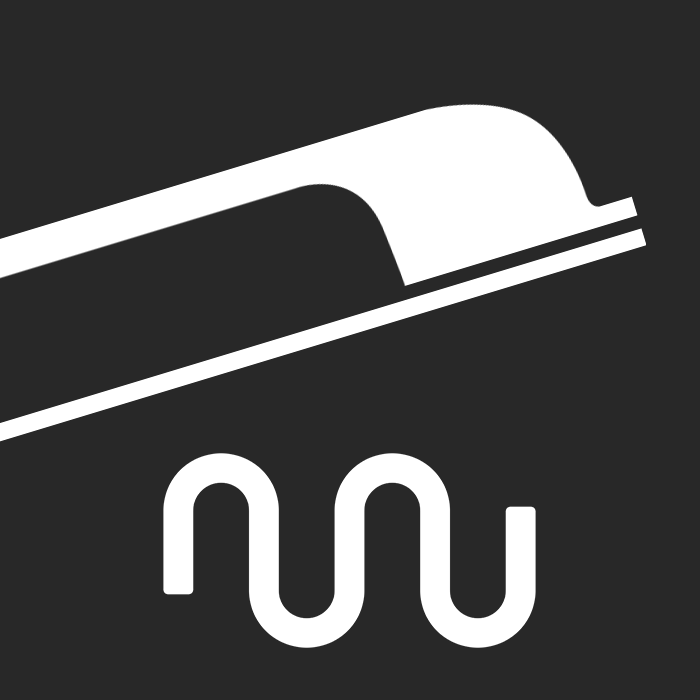 The license agreement for String Studio VS-3 allows authorization on up to two computers which belong to you. You might need, however, more than two authorizations if for example, you get a new computer or change some piece of hardware such as the hard drive. In these situations, it won't be a problem to obtain additional authorizations. With your product serial number, you will be able to generate two different authorizations every 90 days directly from our website. Beyond that threshold, you will have to provide an explanation of why you need an additionnal authorization. Do you offer educational pricing? We do offer educational discounts on our products to students and teachers. Site licenses, representing a substantial savings on the regular price of the products, are also available to educational institutions. For more information on educational pricing or to order please contact sales by email or phone. What’s included with my purchase? Are upgrade paths available for String Studio VS-3? Yes, all the upgrade options are available from your Offers page—the Upgrade button below will take you there. © 1998–2019 Applied Acoustics Systems DVM Inc.